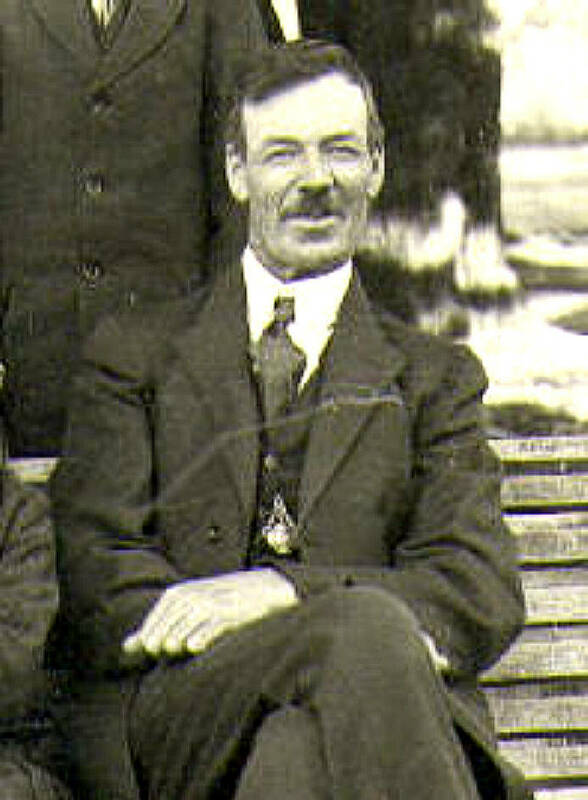 John was the last born of Bonnie William and Margaret’s three children. But he was also the first wed and the first to start the succession of 26 Australian born grandchildren for William & Margaret. John’s full name captured both his mother’s maiden name and that of his paternal grandmother’s – Williamson and Bowman respectively – his name John Williamson Bowman Wilson. John was born in 1830 in what must then have been a tiny hamlet at Cambridge, just out of Hobart on the route to Richmond. We assume he grew up with his older brothers initially at their home by the Sorell Rivulet just 3 to 4 kilometers north of the settlement of Sorell. He married Agnes Eliza Smith McDonald in 1851 at O’Brien’s Bridge (part of Glenorchy today). The image above shows John & Agnes Eliza aged in their mid forties; that below of Agnes Eliza (recently discovered in ‘Flo’s Trunk’) identifies her as being 61 years of age. The eleven children of John Bowman and Agnes Eliza in order of birth were – Margaret Williamson 1852, William McDonald 1853, John Frederick 1855, Agnes Eliza 1856, Edwin 1858, Albert 1861, Arthur 1863, Ellen 1865, Charles 1867, Herbert 1870, and finally another Agnes 1873 (the first Agnes died aged 3). 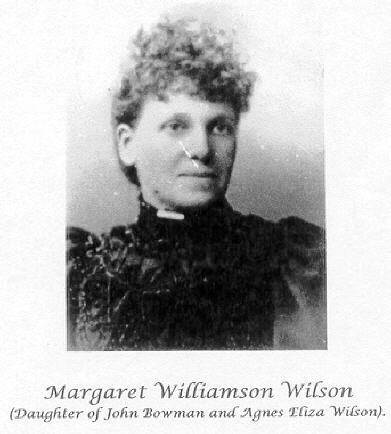 Children up to and including the first Agnes Eliza were born in Tasmania, all others in Victoria (meaning they moved over about 1857), Edwin was born at Melton, Albert on the goldfields at Table Hill near Castlemaine, Arthur and Ellen at Moorooduc, and the rest at Snapper Point (Mornington). Late in 2004 in the lead-up to the Reunion we finally located images of Ellen, Arthur (initially thought to have been Herbert) and the second Agnes – thus completing (with the exception of little 3 year old Agnes Eliza) our image gallery of Bonnie William & Margaret’s grandchildren via their third son John Bowman Wilson. Discovery of these last three images was thanks to the good efforts of two of our cousins, Laurel Scaife who presented those of Arthur and Agnes, and Robyn Lattore from Queensland who presented that of Ellen. Present at our Reunion was Agnes’ grand-daughter Jenny Gould of Melbourne, who was able to confirm Ellen’s image and who was delighted at the same time to see again an image of her grandmother, which had been lost to her family. Concurrently, Jenny brought with her and displayed a neck brooch which had belonged to Agnes, and which appeared to be one and the same as that worn by Agnes in the image. We also have a new image of Charles – Charles died young in 1896, leaving a young wife and family. The new image shows him in military uniform – date must be around early 1890s. The uniform seems distinctive with the dark rounded collar – being pre Federation, this must be Victorian militia. His date of death makes this too early for the Boer conflict. Images of the ten at various stages of their lives are shown below.